It's not too early to prepare your offerings for the holidays. 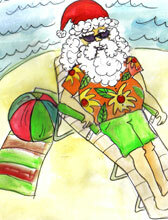 Think summertime is too early to start thinking about the holidays? Think again. With the holiday season just a few months away, now is the time to make sure your listings are ready once that shopping frenzy begins. Seriously, will you really have time to list those 100 or so items in between wrapping your own gifts, organizing family dinners and doing the seemingly endless other tasks that usually keep you busy during the holidays? We didn't think so. Our own product analyst Rebecca Miller starts preparing for holiday sales in July. The planning stages are critical to a good selling season. Good planning helps mitigate frustration and last-minute scrambles and eases the pressure on the listing process. Below, we outline a few tasks you should do in the coming weeks to ensure you're prepared for the season of selling. There's an urgency at holiday time to get and give that hot new item. Whether people are shopping for their kids, spouses, siblings, other family members or friends, people want to be the bearers of the must-have product of the season. Just think about how many times you've stood in line—or been online—ready to buy the next Tickle Me Elmo. Remember how that funny red Muppet with the infectious laugh created such a craze that people were willing to shell out more than $100 to get one? Well, now's the time to find out which products are going to be flying off the shelves—both physical and virtual—come late November. eBay Pulse is a good place to start your search. This site displays the most popular searches, largest stores and most watched items within the eBay universe. You can also browse Google Trends to see what people are searching for. Also be sure to check out niche publications such as Parenting and Good Housekeeping. Both publish lists of the hottest items of the seasons, and they "do a lot of the work for you," Miller reports. If you have children in your house, ask them what they like—especially if the children in your life still play with toys. Let's face it, toy stores are popular destinations during the holiday shopping season. Teens can also tell you what's popular at school. Don't wait until the season is upon us to ask them what they want for the holidays. Ask now. It will not only help you find the right items for your store or auction, it could also help you check them off your shopping list months in advance. Keep an eye out for sales at your local department stores, or scour online shops to see if you can find good deals. With stores stocking fall merchandise earlier every year, many of them start to clear out their inventory in July to make room for new items. This could mean big savings and bigger profits when you post items on eBay, come winter. Don't forget about those post-holiday-clearance items you bought at the end of last year's holiday season. Now's the time to pull those little treasures out of storage and get them ready for listing. Do you remember where you put them? You might have to do a little digging around to find them again. And since they've been stored away for months, chances are they're in need of some TLC. They should look their best when it comes time to post listings. Be sure you clean them carefully, though. You don't want colors to fade, corners to chip or any other damage. Take this time to organize your workspace, a vital step in any listing process, Miller notes. Find a spot that will give you plenty of room for your items, shipping and packing supplies, and the elbow room to actually pack goods. Once Thanksgiving arrives, you'll need as much space as you can get. And keep in mind that having a quiet place to prepare your listings is always a good thing. Taking photos can be time consuming, especially if you post several pictures with your listings—something many Auctiva users do. This is especially a good idea if the item contains an ornate design or hard-to-see details. But why not get the photography out of the way now? With Auctiva's fixed-rate listing plans, you can save up to 1 GB (roughly 10,000 photos) at a time. You could create a folder titled something like "the holidays" to save your images when you load them using Auctiva's eBay image hosting. If you're going to do both fixed-priced and auction listings, you could further categorize your images using different-colored folders so you'll know at a glance what you have. Again, organization is key to making the eBay listing process as easy as possible. While you're at it, try to get some—or all—of your listings completely ready. Remember that you can save your listings in your Auctiva account for as long as you need them. And once they're done, you'll have more time to tend to your own holiday plans. Do these small tasks now and selling will be a breeze when the holiday rush begins. Next month, we'll take you through a selling checklist to make sure you're really ready for the haste that comes with the holidays. Ask Auctiva: Will Walmart Kill eBay? Auctiva's Director of Engineering answers this and other questions from Auctiva customers. Holiday buying frenzy kicks off early. Company's site gives smaller vendors new selling venue. Here's how to ensure you're set for the holiday frenzy.